After spending all day Saturday at an Earth/Arbor Day Event--- I had a booth there for my fund-raising company, E-Waste Fundraising--- I got a call from Kim, who heads up the Los Flores Community Garden where I've got a hive (see post below). A fellow garden member had called her saying there was a swarm of bees that had settled in her compost bin, and could I please come get them? There was an hour or so of daylight left, so I grabbed a nuc box (a small, five-frame hive box; same size as I have in the community garden) and motored over for some free bees! If you said, "Hey, that's not a swarm, that's a brand new hive!" you'd be right. You can see the beginnings of comb there in the middle. The homeowner was sure the bees hadn't been there for more than a day or two, so they were working fast. 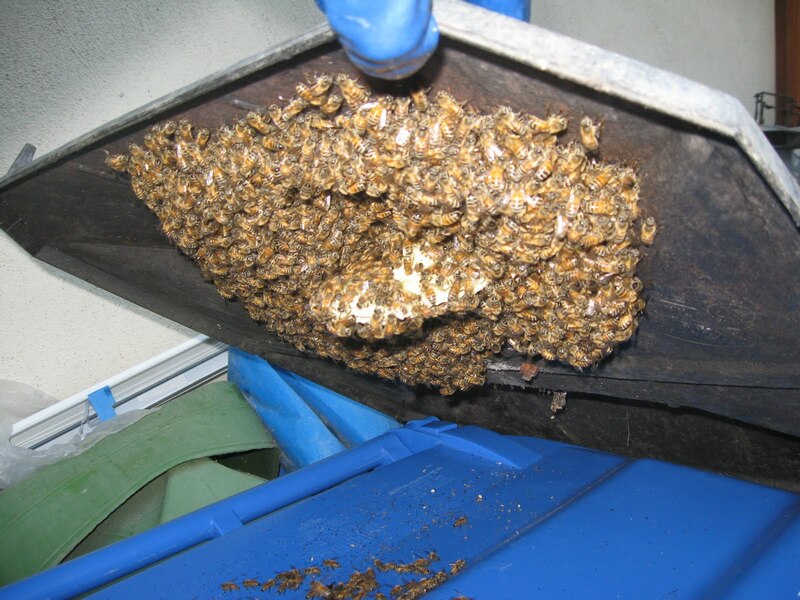 Bees love compost bins, presumably because they're dark and warm and well-protected from the weather. Anyway, I treated them like a regular swarm. Just picked up the lid and shook it over the nuc, with several frames removed. I waited a bit for all to settle, and then put some more frames in. I scooped up by hand any globs of congregating bees that had missed the box, stuck the top on (I had the entrance blocked with hardware cloth) and went home. The whole operation took about 15 minutes, most of which was spent waiting to give all the bees a chance to reorient from the trash can lid. To help that out, I actually leaned the trash can down onto the open hive box, so they could sense the queen inside and would walk in on their own. I brought 'em home, left them for the night in the back of the truck, and put them on a hive stand in the AM. I checked a couple times today; they were orienting themselves and doing very well.